Francis Alimikhena, senator representing Edo north, has accused Ibrahim Magu, acting chairman of the Economic and Financial Crimes Commission (EFCC) of “terrorising” senators because they rejected his nomination. 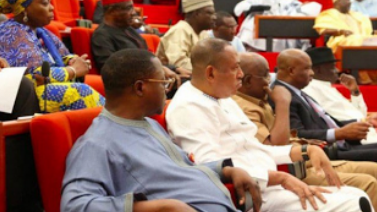 Alimikhena said this on the floor of the senate on Tuesday while contributing to a debate where the senate agreed to suspend the confirmation of resident electoral commissioners (RECs) of the Independent National Electoral Commission (INEC). He expressed supported for the idea of not screening the REC nominees sent by President Muhammadu Buhari until the executive explained its reason for retaining Magu. “When doing something, do it well. What if we refuse one the nominees? That is the question the distinguished senators are asking the executive,” he said. “There is no need for us not to confirm one, and when he goes back, they say, ‘you can continue to act’. So, if we disqualify a candidate and the person continues to act, why did they send the names here in the first place? Let’s not act on these names until the explains what happened to Magu. When told to react to the allegation of the senator, Wilson Uwujaren, spokesman of the EFCC, said he had nothing to say. “Report what you heard in the senate,” he told TheCable on telephone before ending the conversation abruptly. On March 15, the senate rejected the nomination of Magu for the second time in three months. The upper legislative chamber had cited an indictment on the anti-graft czar by the Department of State Services (DSS). The DSS had accused Magu of being unfit to head the commission. “Magu has failed integrity test and will constitute a liability to the anti-corruption drive of the current administration,” the agency had said in a report submitted to the senate. The presidency is yet to react publicly to the issue of Magu’s rejection by the senate. The lawmakers shifted the confirmation of 27 RECs by two weeks based on the disagreement with the presidency.